Crabtree and Evelyn’s range La Source has been around for as long as I remember. I was always a massive fan of the foot scrub and cream but after noticing it has been reinvented I decided to try some of the other products in the range too. The overnight hand therapy is amazing to use just before bed, so it can work its magic on your hands overnight. It is quite a thick cream but it soaks in well and by morning you can really feel a difference. 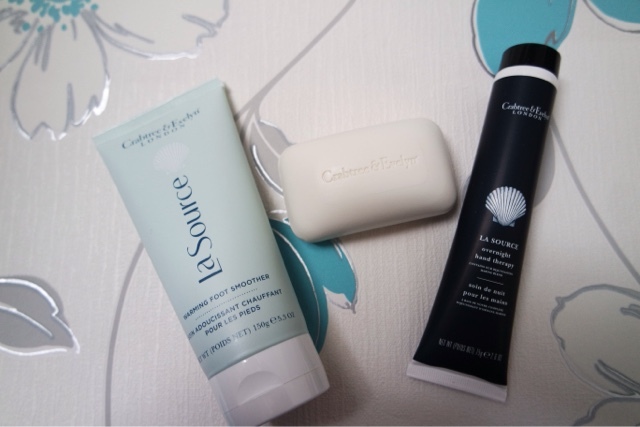 Your hands feel much softer and nourished. The moisturising soap is a great alternative to shower gel. I never really used to use soap on my body as I found it quite drying but recently I actually prefer to use them. This particular one is really kind to your skin and moisturising too. I love anything with shea butter in! Previous Article Have you ever used Bidvine? !